All of our Bespoke Traditional Wine Racks, whether for Standard sized bottles, Halves or Magnums can be made to your required size. 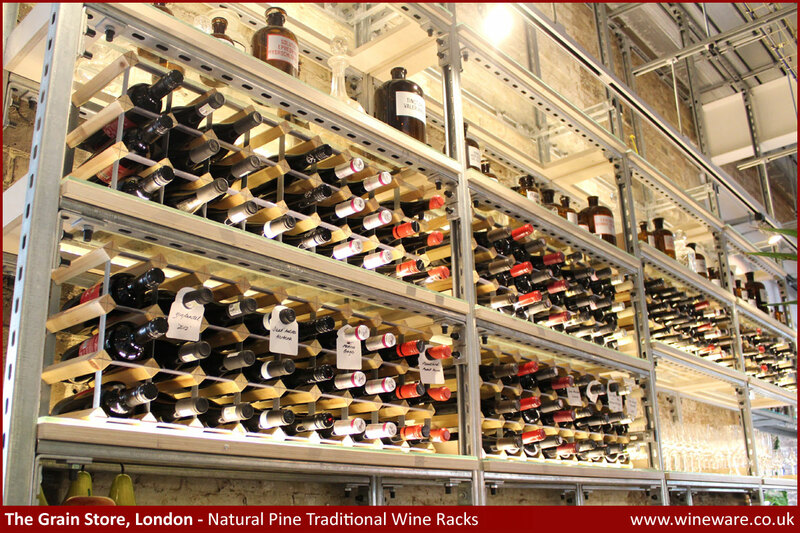 Wineware's Bespoke Traditional Wine Racking starts from as little as £1.19 per bottle hole! Our racks can be made to fit within your available space so please phone or email your requirements including measurements and plans if available and we’ll be happy to advise you on how many bottles your space allows and the costings involved. 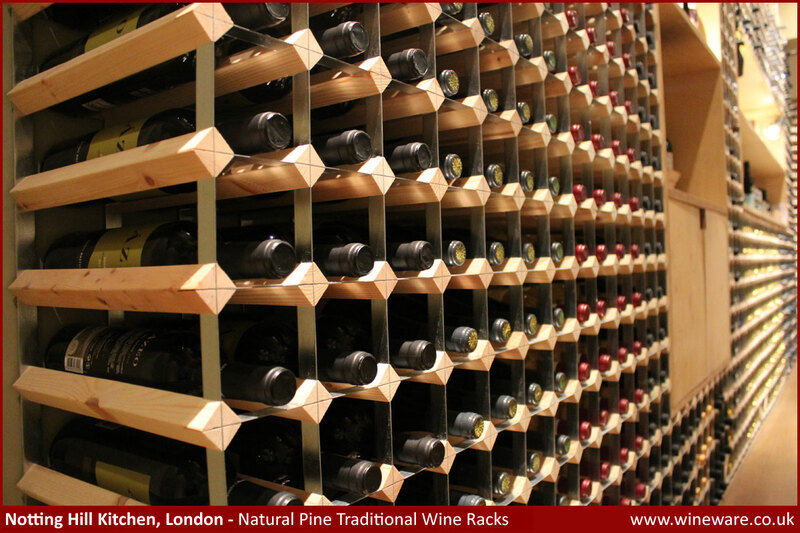 These types of racks can be constructed to suit a customer’s own particular wine storage requirements, in order to fit any space in any shape or form. The Wineware standard bespoke traditional wine rack will accommodate all bottles of the normal 75 cl size, including half-bottles of Champagne, as well as Moët & Chandon, Cristal, Ayala, Lanson, Piper Heidsceck and Pol Roger style bottles albeit quite tightly, whereas Bollinger, Krug and Dom Perignon style bottles are slightly larger so these are ideal for the Champagne sized racks. It is also possible to manufacture these to hold half-bottles or Magnums, please be aware that due to the different sized bottle spaces, the horizontal lines will not be consistent between the three sizes of racks. There are two different options for single depth wine racks (220mm and 300mm) but there is a double depth option (533 mm), these are designed to hold two bottles in each opening and these can also be made to order. 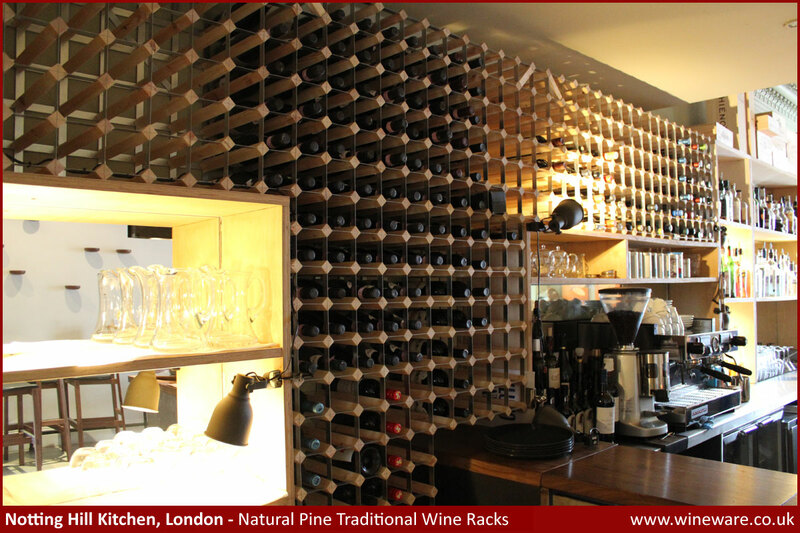 You're able to put a made to measure wine rack into any hole or space in your home or commercial property! Our Bespoke Traditional Wine Rack Dimensions Chart allows you to size up your potential area and find out just how many bottles you'll be able to store. 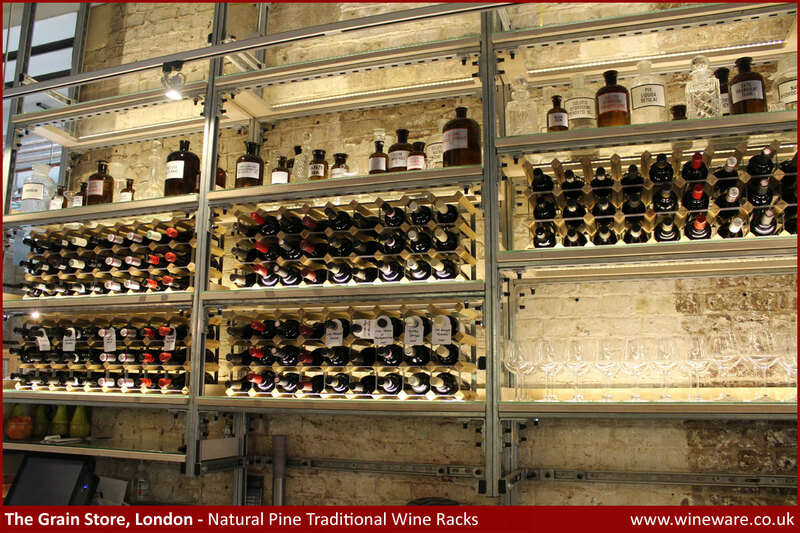 The racks including on the dimensions chart are: standard bottle, half bottle, magnum bottle and champagne bottles. Click here to view the Wineware Wine Rack Dimensions Chart. How to calculate the size of a rack? 1 - Measure the height and the width of your available space. 2 - Using the Dimension Chart above, read off the number of bottles which appear against the measurement immediately below your available height. 3 - Repeat the above process for the width measurement, this will then give you two bottle hole totals, one for height and one for width. Example: If the available space measures 72” by 57”, your rack will accommodate 18 standard bottles high by 14 standard bottles wide, giving you a total of 252 bottles. If you need further help with this, please either phone us on 01903 786148 or email us info@wineware.co.uk. The traditional racks are built of solid Natural Pine, but the wood can be stained in Dark Oak, Oak, Light Oak, Black & Mahogany Stain finishes if you so wish at a small additional charge (see below). They are intended to be stood on a level floor and wall fixing points, (eyelets) are provided for this purpose. Securing the racks to the wall is strongly recommended by using these fixing points with properly drilled holes and rawl plugs. Wine racks that do not stand directly on the floor should have strong additional supports underneath, such as shelves or brackets, we do not suggest that you hang the racks off of the wall. Please Note: The standard bottle and half bottle racks are constructed from galvanised steel (1.1 mm thick) and the magnum and double depth wine racks are constructed from 1.2mm thick galvanised steel. We're able to fit and install you're very own, fully functioning wine cellar / wine room. 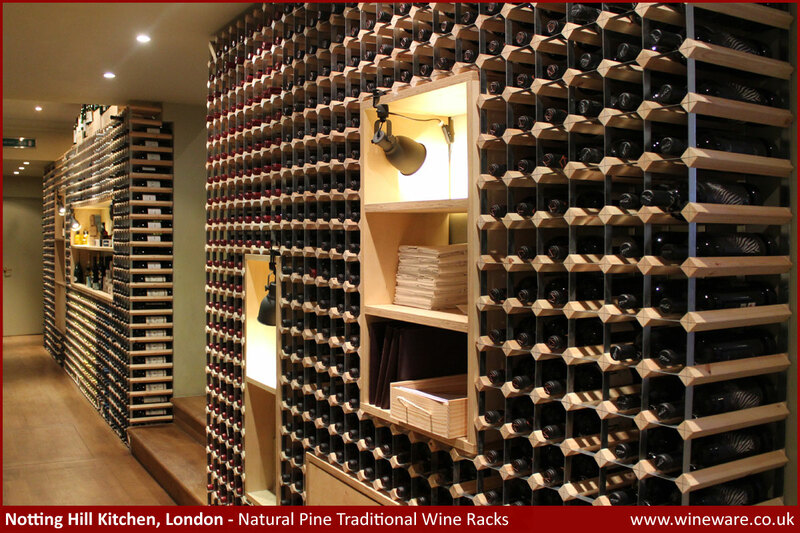 We can design and draw up plans for traditional wine racking or a mixture of wine racks, cellar cubes, case racks and more to complete a whole room! 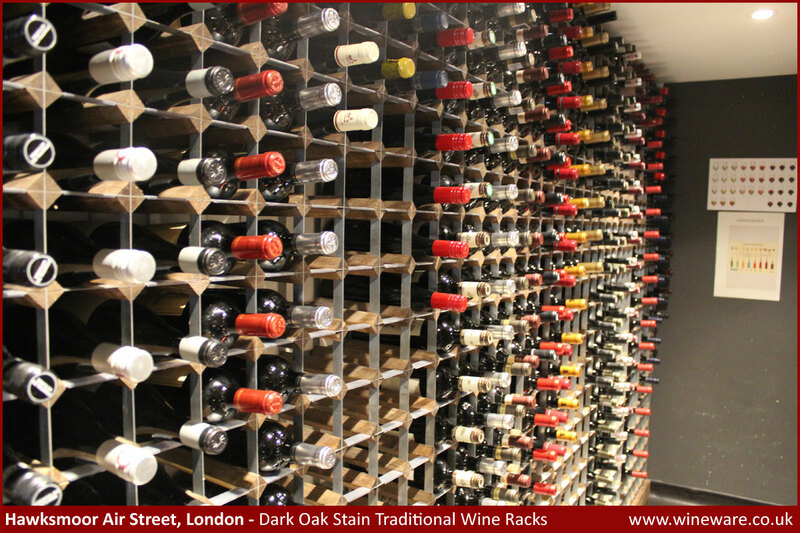 If you're looking for some inspiration, check out some of our finished wine racking projects to give you some ideas in finding the perfect wine cellar for you! 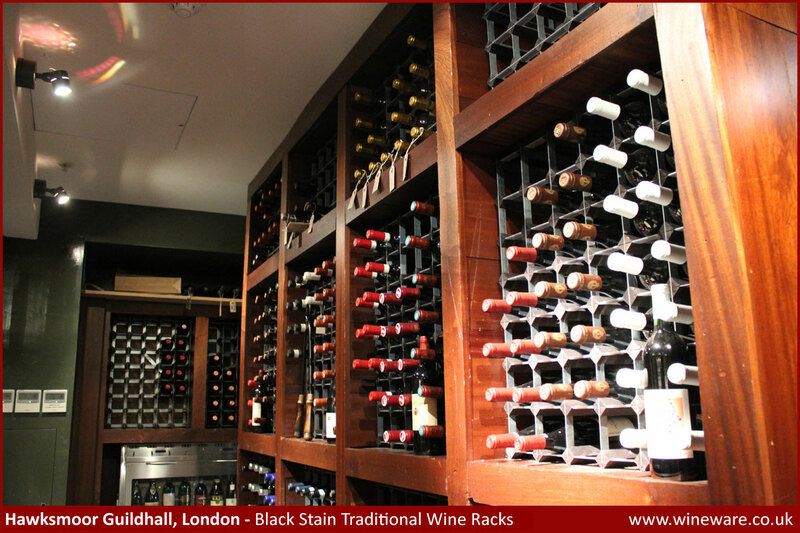 Click here to view some of Wineware's Wine Cellars / Wine Rooms. Prices for Traditional Wine Racks - Price per bottle hole - All prices shown include VAT. When ordering please check that the racks overall measurements, if constructed in one piece can be handled easily through any doorway or around corners to reach its final destination. 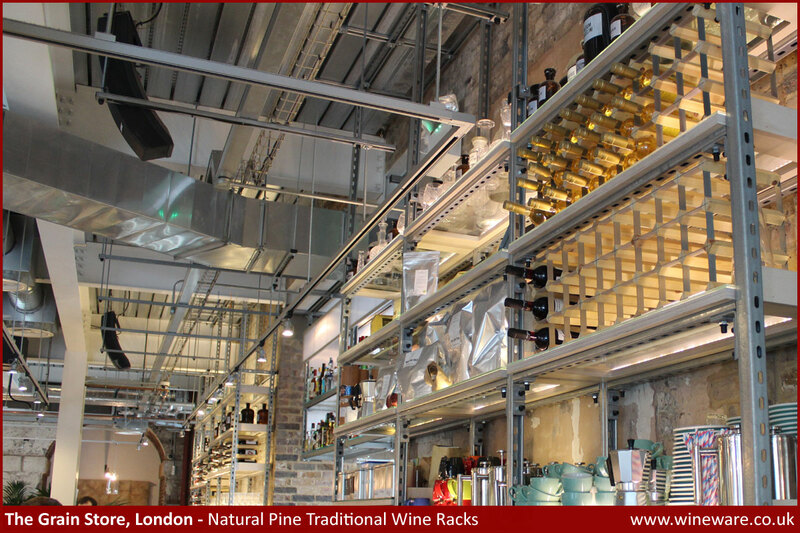 If this is not the case, the rack(s) can be manufactured in appropriate sizes and joined with connecting kits (see below) which are attached very easily by the customer after delivery, with no adverse effects on the final look or strength of the wine racks after installation. If the rack needs to be split into two or more pieces for either ease of access or handling, then please note the rack is always split and connected vertically only, and never horizontally because of the bottle weight when full. 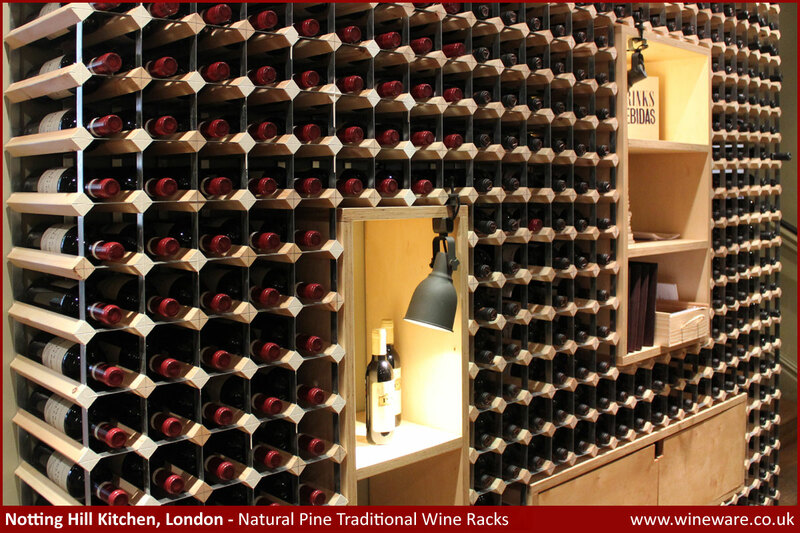 To add something a little extra to your traditional wine rack, why not opt for pine plinth for a good sturdy base. Plinths are a great idea if the floor is uneven and they also prevent the bottom bottles from being accidently knocked or kicked. They can be built to heights of 94mm or 120mm, whatever your preference and vertical space available. 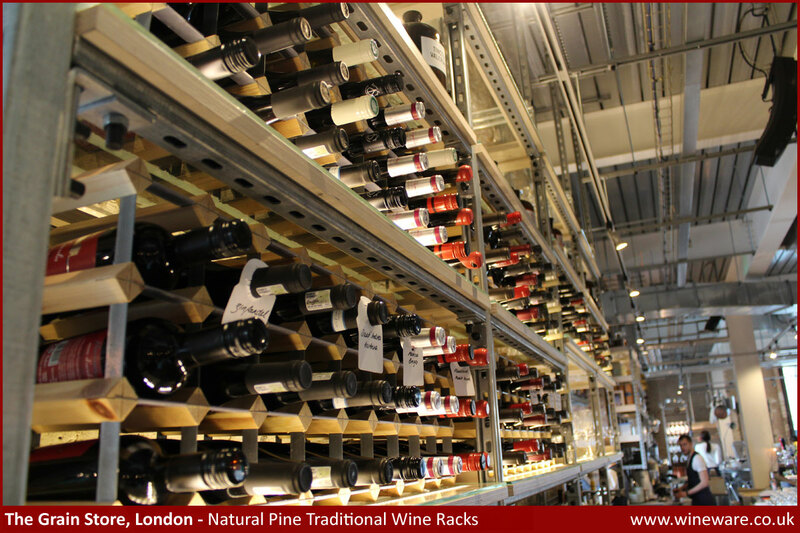 As with the traditional wine racking, it can be left as standard in natural pine or it can be stained in one of our finishes to match the rack. The plinths have adjustable feet built in so you're able to slightly change the height, whether this be on all four corners or a select few if the floor is uneven. Prices start from just £58.00 for the first metre. The tops can nicely finish your rack off in style and also add an additional area for storage. Prices for the tops start from £30.00 for the first metre. What else can I use a traditional wine rack for? - Towels, Yoga Mat Storage + much more! Our selection of wine bottle neck tags are great for labelling and identifying your wines when they're stored within your rack. We supply different pack quantities and different types of tags, plastic, paper and card and we also offer the perfect pen to help label your wines! Wine Bottle Cellar Sleeves are the ideal answer to dust free bottles and stain free labels to keep your bottles in pristine condition from purchase. These are available in two different sizes, a standard bottle size and a magnum bottle size and are available in set of 100, 500 and 1000. The clear plastic label protector clips can be fitted onto the horizontal metal strips of the wine rack between the pine slats, this will protect the front and back labels of the wine bottles when inserting or withdrawing them from the rack. The protector clips are available at a cost of £0.25p per clip. We can supply lockable metal doors for Traditional Wine Racks, if you are interested then please contact us with the sizes you require for a quotation. If you're after a small, fully assembled traditional wine rack you might be interested in one of our stock items. We stock a 16 Bottle (4x3), 20 Bottle (4x4), 30 Bottle (6x4), 40 Bottle (7x5) and a 42 Bottle (6x6) rack, all available for next day delivery. 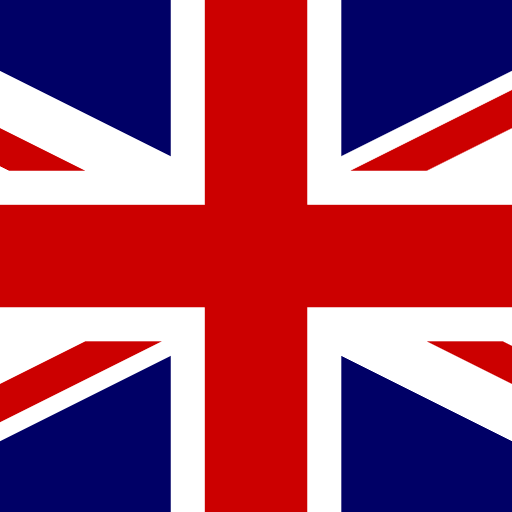 There is a delivery charge of £19.95 for all traditional wine storage racks, this covers most parts of the UK mainland. The delivery charge of £19.95 is a flat fee whether you purchase 1 rack or more. Please contact us for quotes for other delivery addresses. Tel: 01903 786148 | Email info@wineware.co.uk. 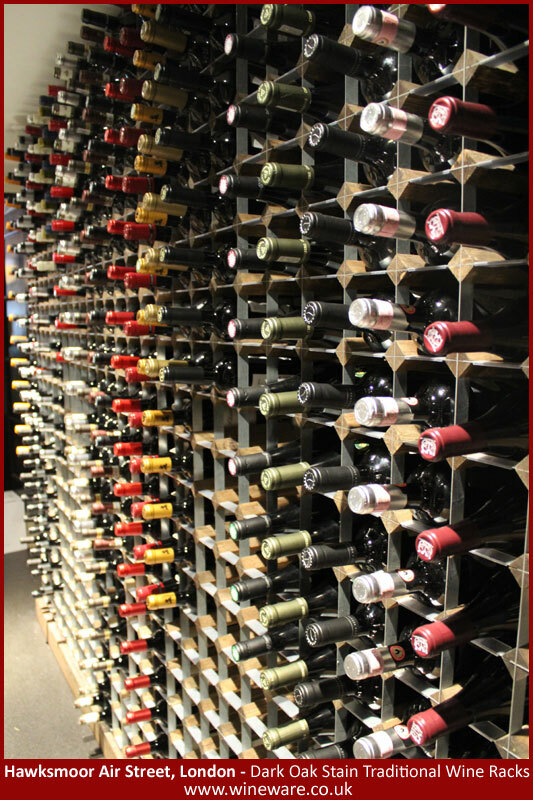 On larger, heavier wine racks we reserve the right to add a supplementary charge to cover additional delivery costs. All our made to measure wine racks are constructed and delivered to any mainland UK address, barring any unforeseen circumstances, delivery normally takes 10-14 days from the date of your order. Payment is taken with order, invoices are sent via email and we will telephone advise the exact delivery date when known. Double check your sizes! Width, Height and total bottle size. Get in contact with Wineware! You can either call 01903 786148, email info@wineware.co.uk or post us with your measurements (using the wine rack order form). We will go through it all with you, making sure your measurements and calculations match up with us! We will also make sure that the size you’ve chosen will actually be able to get to the area where you want to position it, if it’s made in one piece. If this isn’t possible we can make the rack in two or more pieces in order to make it fit through doorways etc. and this can then be connected back together once in place, to make one large rack and you’ll never spot the join! Wait for your rack to arrive – simple! 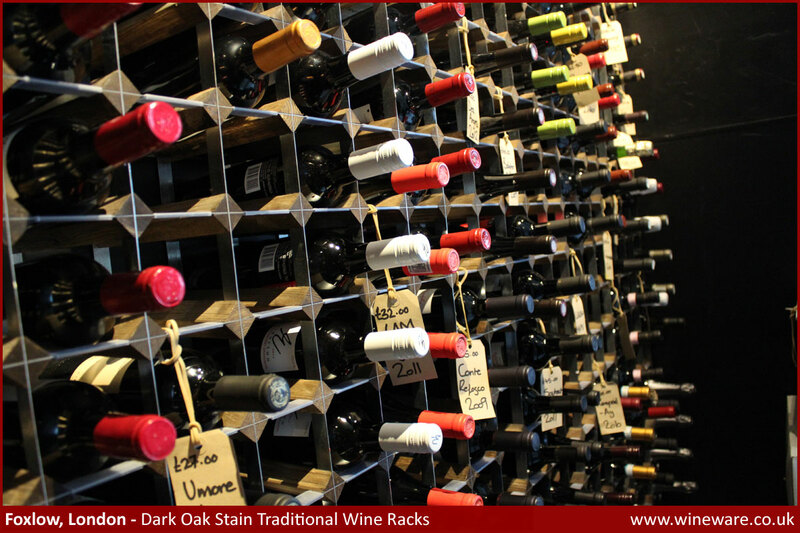 If you require further information, please see our Traditional Wine Racks Frequently Asked Questions. Here we explain how to fix your traditional rack to the wall, how to connect two traditional wine racks together and much more! 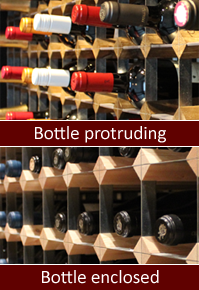 See our 'Useful Downloads' regarding our Traditional Wine Racks.